The POS system is currently going through a major transition in two aspects. First aspect is the widespread use of the Internet. As the use of the Internet has become a norm, various services using the Internet are provided as web services. Also the use of cloud services is already underway. The use of the Internet enabled implementation of low-cost POS systems that can be accessed from anywhere. The second aspect is the rapid spread of general purpose smart devices such as tablets and smartphones. Smart devices can be deployed in shops and restaurants as POS devices as well as its home and office use. There are the following advantages in using smart devices instead of designated POS devices. In such a revolutionary period, the following POS systems are emerging. Tablet POS is a POS system that deploys general purpose smart devices such as tablets and smartphones as POS devices. They have a close affinity to the Internet since smart devices are already assumed to be connected to the Internet. However, the advantage of Tablet POS is not limited to the use of portable smart devices. It improves the value of POS operations significantly by enabling you to perform shop's internal operations at optimal locations rather than a fixed location. For example, it allows you to use a smart device as a customer service tool in shops with a large graphical screen. This makes a difference from legacy POS systems that deploy designated POS devices. While Tablet POS makes shop's internal operations portable, Web Based POS enables shop's internal information assets accessible from anywhere. You can make shop's internal information accessible from outside and link it with various web services on the Internet. Although it was difficult with legacy POS systems, you can coordinate shops and use POS data more practically such as analyzing it from different angles. 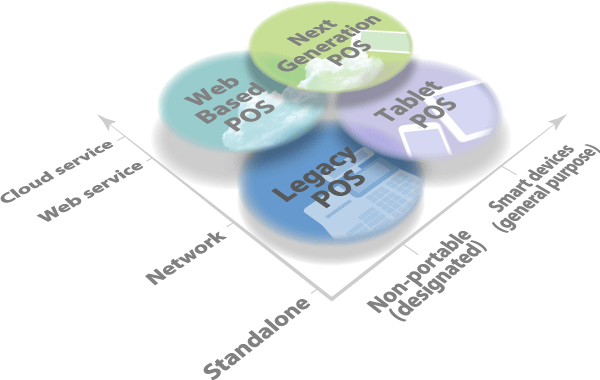 Next Generation POS is a fusion of Tablet POS and Web Based POS while making full use of cloud services. This changes the form of business operations by merging shop's internal and external information which was previously stored in the system at the premises, into web data in the cloud, and use this data from anywhere in the shop. While new POS systems offer great advantages and development possibilities, there are some technical issues to be resolved. Epson provides technical solutions to these issues. OSes on smart devices are different from the existing POS systems. No simple programming method available for controlling peripherals from web applications and smart devices. Generally Web Based POS systems keep the POS data (order data, sales data, etc.) on web servers on the Internet. Therefore, the operations are halted when the Internet connection is lost. In order to avoid this issue, TM-Intelligent are embedded with the web server function to retain the database necessary for the POS operations. You can implement a system with uninterrupted operations by communicating between devices in the shop even when disconnected from the Internet. Transmitting print data from HQ servers to shop printers is difficult due to the nature of web services. You can easily implement a system that can print on request from web servers by deploying a mechanism that the web server responds to periodical print data requests from the client. The ePOS-Device technology is developed to control TM printers and POS peripherals easily from smart devices and web applications. Epson is providing TM printers and TM-Intelligent (TM-i Series and TM-DT Series) with wireless LAN and Bluetooth® interface support to implement these technologies in a form of hardware. You can connect POS peripherals directly to TM-Intelligent and use these peripherals from smart devices and web applications. Also, you can control TM printers on the network via a TM-Intelligent. You can develop POS application software easily using development tools in Epson ePOS SDK. TM-Intelligent can also be used as web servers. Web service functions such as Server Direct Print and Web Contents Update will assist your Web based POS system implementation. [Note] *: please refer to Technology page. The following graph indicates the numbers of searches for POS related terms in Google. As shown, the numbers of searches on Tablet POS and Web POS are increasing. Please refer to the Contact Us page if you have any questions related to purchase. Please refer to the Success Story page if you are interested in success stories.